The quantities of hazardous waste are increasing. Because of the contained environmentally dangerous substances hazardous waste has to be collected, recovered or deposited separate from other waste. In 2008, the quantity of generated hazardous waste increased by 47% compared to 2007 and amounted to 143,000 tonnes. The reason for such increase was hazardous waste and soils from the site restoration of tar disposal landfill in Pesnica and construction waste (containing asbestos) after heavy thunderstorms. 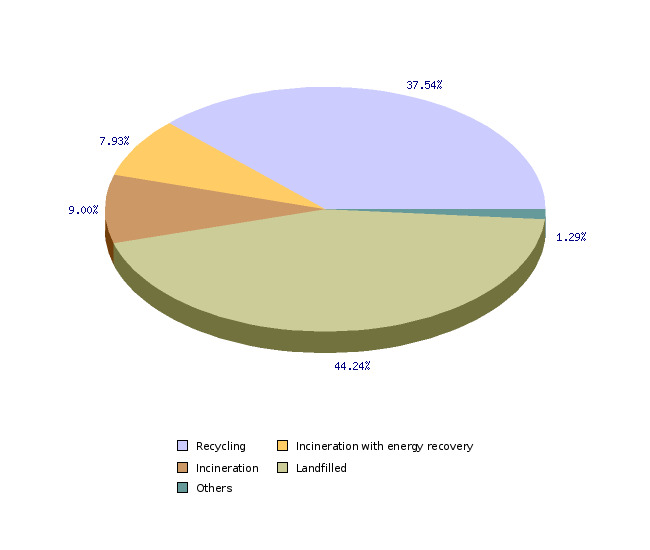 47 % of hazardous waste was recovered and 53% deposited. Hazardous waste has one or more hazardous characteristics which are harmful to health and/or the environment (e.g. flammability, irritancy, toxicity, mutagenicity, oxidizing properties, infectivity, etc.). Mandatory management of hazardous waste is specified in the Decree on waste management (Official Gazette of the Republic of Slovenia, No. 34/08). The Annex to the Decree contains a list of hazardous waste including the list of properties due to which such waste is classified as hazardous waste. - To achieve, in the years to follow, at least 1 kg of collected hazardous fractions per capita per year within the operation of the local public service for municipal waste management. Hazardous waste requires a stricter regime of control than non-hazardous waste, since it poses risk for the environment and human health. Therefore it must be collected, deposited, recovered or destroyed separate from other waste. Hazardous waste is generated in industrial, trade and agricultural production and processing as well as in households (e.g. solvents, paints and dyes containing hazardous substances, pesticides, fluorescent tubes and other waste containing mercury, paints containing hazardous substances, certain medicines, motor vehicles etc.). The total quantity of generated hazardous waste is gradually increasing. Partly thanks to improved collection following the implementation of regulations adopted in 2003 and 2004 for the management of certain types of waste, and partly due to of persons liable to report. In some years, the quantities reported were above normal. In 2001 increased generation of hazardous waste resulted from an extraordinary event, after 2004 the quantities registered have been higher due to the changed methodology (e.g. construction waste containing asbestos became classified as hazardous waste). In 2008 the quantities increased due to land restoration and thunderstorm consequences. The most significant growth in the quantity of hazardous waste was observed in construction and demolition waste (group 17). However, most hazardous waste is generated from organic chemical processes (group 07). In 2007, Slovenia generated 96,888 tonnes of hazardous waste. Production of hazardous waste was the reported by 2561 liable entities who generated 253 types of hazardous waste. Both the number of reposting entities and the total quantity of reported generated hazardous waste increased in comparison to previous years, and almost reached the quantity of 100,000 tonnes. In the 1999-2007 period, the quantity of generated hazardous waste grew by 205%, and in the 2004-2007 period by 18%. In 2008, the quantity of generated hazardous waste even grew by 47% compared to 2007, and amounted to 143,000 tonnes. The reason for such increase was the restoration of tar disposal landfill at Pesnica where 18,200 tonnes of acid tar was dug out and 14.286 tonnes of contaminated soil was deposited. The quantities of hazardous waste also increased after thunderstorms which forced many house owners to replace the asbestos roofing. In 2008, we moved very far away from the target of reducing the generation of hazardous waste quantities by 5 to 10% per year. In total, 47 % of hazardous waste was recovered and 53% of hazardous waste was deposited in 2008. 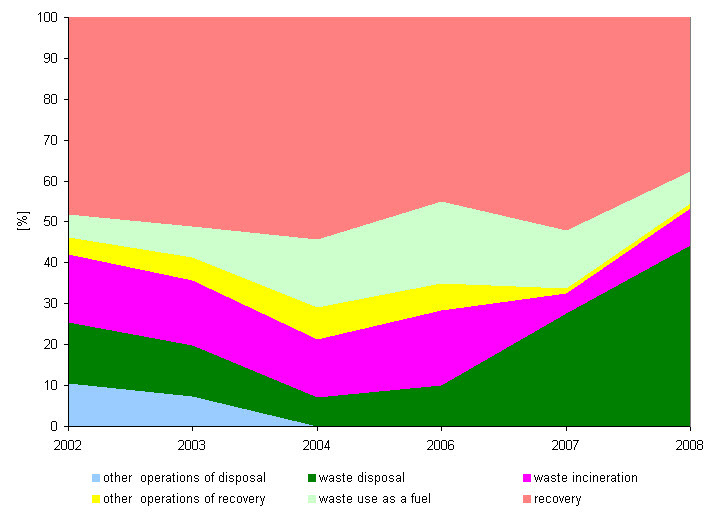 Compared to 2002, the quantity of recovered waste increased by 31%, and the quantity of deposited waste by 106%. In 2008, Slovenia reached all-time high with 54,000 tonnes of hazardous waste deposited (46%), 46,000 tonnes recycled (38%), 11,000 tonnes incinerated (9 %), and 9,000 tonnes used for fuel (8%). Compared to 2007, the quantity of deposited hazardous waste increased by 72%, while the quantity of recycled waste was reduced by 21%. The Eurostat data show that the quantity of hazardous waste is increasing in most EU Member States, and methodology questions regarding the determination of hazardous waste quantities and their comparability have also been raised at international level. 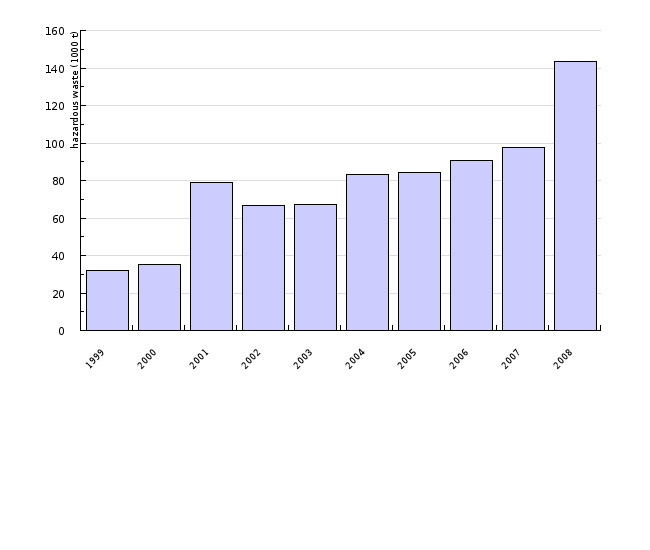 Figure OD3-1 shows the total quantity of generated hazardous waste for the 1999-2008 period (in 000 tonnes). The waste catalogue, on the basis of which the liable entities report on the quantity of individual types of waste was modified in compliance with the amendments of European legislation in 2001. Some further modifications were introduced in 2003. The submitted reports are entered into the database. The Agency checks if all liable entities have submitted their reports and missing reports are submitted. In case of irregularities or failure to report, the data are verified and reconciled with each liable entity.